Tabitha Rayne believes in love above all else. Love and good quality stockings. She lives in Scotland with her family and is equally happy in stormy rain or blazing sun - or even both at the same time. Writing is her passion and luckily for her, she combines the two by writing about passion. Lena hardly breathed as her fingertips reached out to the tiny flapping creature. Could it be? She trembled, trying to stifle her excitement with the fear that it might disintegrate beneath her touch, just as it had nightly in the dreams that plagued her. Closing her eyes, she waited to be jolted into the reality of her cold, empty room. But it was different this time; her fingers flinched as they brushed something real. Lena opened her eyes and picked up the golden butterfly, laying it in her palm. Slowly, the tiny wings stopped beating. Lena realized her lungs were at bursting point and exhaled up into the ceiling, fearful of sweeping the treasure away with her breath. She studied the lifeless creature carefully. It was so beautiful, so intricate. "At last," she whispered into her quivering hands, bowing over with relief. "I've been waiting so long." Lena James Lee waited excitedly in the bustling throng of women all the same age as her. They had been picked up by the coach from various stops throughout the country and most were rumpled, tired, and anxious. They all knew why they were there; their fates had been decided by the Archmatrias long before they had known anything of the manors or what it meant to be a collector. Lena's mother had been so proud; she was the only one in her whole community who had been given the special invitation to attend training. "Remember, Lena," her mother had advised quite forcefully, "it's not just your life that depends on this." Lena had hopped on the coach without a care in the world. Now though, rumors swelled, starting with hushed whispers and giggling until all-out mayhem ensued. "They make you wear nothing but a golden thong and you have to crawl around on the floor, parading yourself," Mae, a loud, stunningly beautiful girl shrieked. "Are there really men? Do we get to see them?" Lena tentatively asked her in a rare quiet moment. "Honey, we do more than see them." Mae cackled and swiped Lena playfully on the back of the head. Lena felt her cheeks burn, it was clear that the other young women knew a lot more than she did. "Are you really telling me you don't know what you signed up for?" Mae leaned in to Lena. "Has no one ever told you what that's for?" she whispered lavasciously into Lena's ear and slid a hand up the inside of her thigh. The truth was, Lena had been brought up with great solemnity about becoming a collector. All the girls were vetted and tested from a very young age and if they showed promise in any of the four categories, their life was pretty much mapped out for them from that day. Lena had been pinpointed as a good candidate for a collector because of her striking looks, poise, and perfect proportions. "Lena, my dear." Mae looked at her intently. "I think your mother followed the rules on abstinence and denial a little too carefully!" Mae rolled her eyes. "I've never met anyone so sexually unaware in all my life! You must be at least twenty-one, and I bet you've never even pleasured yourself, let alone anyone else." Lena recalled the delight on her friends' faces when she'd brought out her prize-winning lemon meringue pies at tea parties. "Yes, I have," she said defiantly, knowing in her heart that confectionary was not what Mae was talking about. 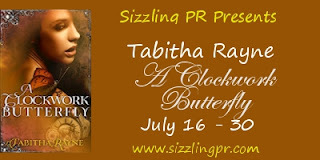 Great excerpt and I am looking forward to reading Clockwork Butterfly! Great work! Glad to have you. The cover is stunning.